we are often better known as the Mom or Dad of our children. At human school, I am proud to be Gavin & Vera’s Dad. school in town, I am so … Schmoo’s Daddy! Want to open your own doggie day care? Let Craig’s 15+ years of experience be your guide! As the leader of an organization that has cared for well in excess of 1 Million dogs, Craig has shared his expert advice on everything & anything related to dog care on CNN, HLN, HSN, TBS, The Weather Channel, ABC, CBS, Fox, HGTV and numerous publications. If your organization needs commentary on anything from dog behavior and care to dog décor and fashion, please contact Craig via email at craigkoch@wagalot.com. 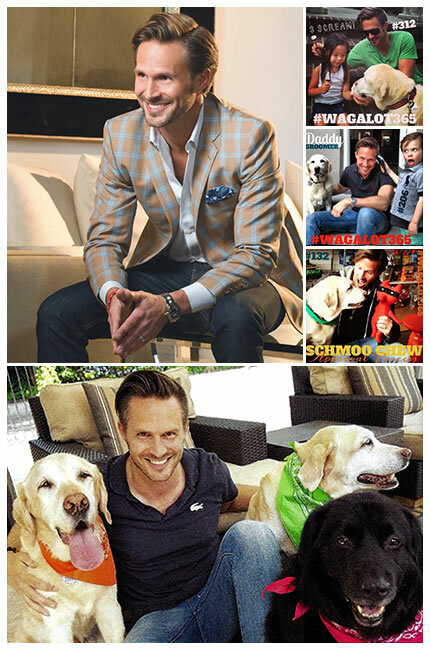 *The first 365 postings on SchmoosDaddy Instagram account make up a very personal project Craig named #WAGALOT365. These postings captured a year in the life of Schmoo … one photo for 365 consecutive days. Fur kids often take a back seat when human kids arrive on the scene. Schmoo was such an important part of Craig’s life that he wanted to find a way to hyper-bond and reconnect with her during her 15th year of life. As you will see, Schmoo is a crucial and adorable part of Craig’s family … day in, day out!